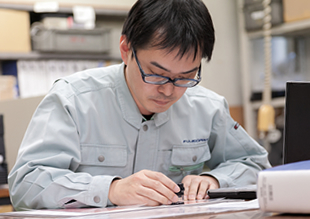 Quality Management | Management | FUJICOPIAN CO., LTD.
"Quality" is vital to maintaining the relationship of mutual trust between a company and its customers. in all areas in order to ensure the reliability of our products and to provide stable quality. We have achieved a high level of "QCDS of Products" (Quality, Cost, Delivery Time, Safety) by using our documentation system which reflects past progress items and experience accumulated over many years. In addition, all related divisions review the design, and evaluate compliance vis-a-vis our QCDS objectives and intellectual property issues such as patents at each phase of design and development. Procurement activities must change to a new style of production as high-mix low-volume production is becoming main stream in the manufacturing industry. Our quality assurance activities include strict quality checking of procured goods and regular visits to our suppliers to get a first-hand look at their quality management so that we can maintain the quality of our products. A wide variety of ink manufacturing machines and high-precision ink-coating machines are in operation in our company. 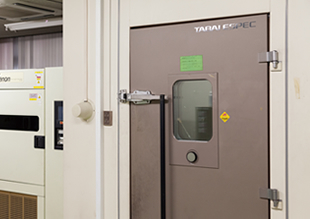 We have prepared detailed standardized procedures to fully utilize these machines and achieve consistent quality. In addition, we have an original training system and operators are given the proper training in order to operate this advanced equipment. We are also working on production innovations by introducing cellular production to handle high-mix low-volume production. Evaluation tests are conducted under strict environmental conditions to maintain reliability. The key to providing satisfaction to our customers rests in understanding their needs quickly and precisely and immediately reflecting what we understand in our services. We assign dedicated personnel to each customer, and collect information directly from our customers for this purpose. All sales representatives are provided with a laptop PC so that they can keep close contact with our office staff from anywhere. Information gathering from our customers is enabled in this way. Fujicopian has been working across the board to strengthen its organizational capabilities and to build a better quality assurance system in order to further improve customer satisfaction. 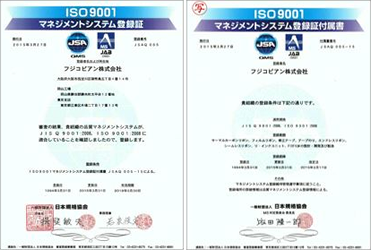 Our Okayama Plant acquired ISO9002 certification in March 1994. Following the strong example of this achievement, we documented and standardized our technological know-how, and made efforts to raise awareness in each division. In 2003, we acquired company-wide certification of ISO9001.